WHEN Philippine Stock Exchange (PSE) President and CEO Hans B. Sicat was growing up, he recalls his siblings and himself being always riveted by the debates around the dining table, particularly those between his father, renowned Marcos-era economist Gerardo Sicat (whose groundbreaking 1980s textbook, "Economic", is still being used by many economics students today) and his equally accomplished mother, the late Loretta Makasiar, a political science professor. “It was very interesting to listen to these political discussions because my mom was a political science professor at University of the Philippines [UP], which is essentially leftist in outlook and anti-any administration. They would talk about—my dad’s a free market economist and my mother’s a political scientist, and she would say, ‘But that doesn’t redound to the benefit of the masses!’ Then at some point, my dad joined the [Marcos] administration,” Sicat, 52, recalls with a chuckle. “The irony, too, was that my maternal grandfather [Felix Makasiar] was a Chief Justice on the Supreme Court for a while before he retired. That made it doubly interesting, because there was a specific period when at least two people related to my mom were in the administration then. And she was an outspoken political scientist who thought capitalism wasn’t the answer,” he remembers, amused at the thought. The eldest of five siblings, Sicat says it was these discussions at the dining table, which became heated on occasion, that “helped define what we were, and what we [my siblings and I] were doing. At the beginning we had no clue, but as we got older, I began to think it made for a good foundation.” No doubt, it was his father who influenced Sicat’s foray into the world of economics while a student at UP, and, later, at the University of Philadelphia for his PhD. But Sicat confesses that he actually didn’t know what course to take in college, and was actually debating whether he should become an engineer or a medical doctor. To defer making a decision, he took math instead—which allowed him to play a lot of tennis. “Since we were young, I already liked to exercise a lot, play tennis, run or whatever. I was always trying to figure out what was the least amount of schoolwork I could do so I would have more court time. Oh, boy, the political science and the humanities [students], they’re always reading, so much reading! I would think back then, maybe if I go into physics or engineering or something like that, if I could get through the problem sets more quickly, then I would have more time to play!” he laughs. While Sicat may not have ended up at Wimbledon with all those exertions on the court, he did become an age-group tennis player, and was a member of UP’s varsity tennis team. 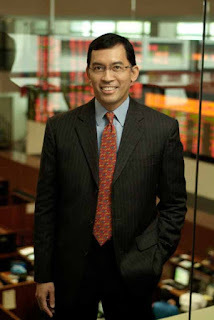 Prior to his affiliation with the PSE (he also served as its chairman and independent director from 2009-2011, then had a first term as its president in January 2011), Sicat was an investment banker for over two decades, during which time he had helped sell “the predecessor” of the mortgage-backed asset securities, or what he jests, “the structured notes that blew up the world”. One of the more interesting deals he worked on while at Citicorp was the privatization of Segba, Argentina’s power utility in 1992, which he describes as a “complex situation” due to the massive amount of work put into discussions with the Argentine government and prospective buyers. Sicat’s wife, Regina, is CEO of their family-owned LegisPro Corp., a legal-process outsourcing firm. They have three children—Kimberly Isabel, 19, a sophomore at Brown University; Katerina Mariel, 17; and Matthew Alexander, 16, Grade 12 and 10, respectively, at the International School Manila. If Sicat seems to have an extra spring in his step these days to go with his usually cheerful demeanor, you can bet that there are only good things happening in the stock market. Since 2010, the bourse has been coming along nicely, and was the best performing stock market in Asia, and third-best in the world in 2011. The PSE index (PSEi) closed at a new all-time high on Nov. 5, bucking the general decline across other markets in the region, which were focused on the leadership transition in China, Greece's debt struggles, and the US elections. The bourse kicked up 33.31 points to close at 5,457.82, or 0.61 percent higher from the previous close of Oct. 31. The Nov. 5 close was also up 1,085.86 points or 24.8 percent higher, year-to-date. The PSEi has broken through new record highs for a total of 24 times since the beginning of 2012. Sicat attributes the bourse’s exceptional performance to the country’s sound economy—with inflation benign and interest rates at their lowest levels—as well as strong corporate financials. With the renewed confidence in the market, he is quite optimistic that more companies will be raising their needed capital via the exchange. In 2011 the amount raised reached P107.5 billion—almost 27 percent higher than the previous year. For 2012, Sicat projects the amount to hit P197 billion, or almost double the amount raised in 2011.